I’ve posted up a number of things about the workplace over the years, and also about a lot of the current-day issues of over-connectedness and the average 72-hour workweek of many managers. This is reflected in this article from last year – Working while Not Working – The Problem of Overconnectedness – which shared a bunch of statistics and issues and data. I came across another interesting site that I thought to share, one that focused on general thinking about The Workweek and that shared some interesting thoughts on our assumptions. Why do we have 8 hour work days in the first place? Widrich writes with the idea that workers or managers somehow have a choice about their workweek. Maybe that is true, but there is a LOT of data that suggests that the average worker is a LOT more connected and involved than that simple 8 or 9-hour workday. Many of us own our own businesses, and my week is pretty much described as, “always.” I will respond to email on Saturday night at midnight and work 6 hours on a Sunday before turning on the TV and watching a movie while I write this blog. How can one even calculate how many hours a week I am connected in some manner to the business? Manually increase the relevance of a task: Now, a lot of us still might struggle to find the focus, especially if no one set a deadline to it. Overriding your attention system, and adding your own deadline together with a reward has shown some of the most significant improvements for task completion. Split your day into 90 min window. Instead of looking at a 8, 6 or 10 hour work day, split it down and say you’ve got 4, 5 or however many 90 minute windows. That way you will be able to have 4 tasks that you can get done every day much more easily. Plan your rest so you actually rest: “The fittest person is not the one who runs the fastest, but the one who has optimized their rest time.” Says Tony Schwartz. A lot of the time, we are so busy planning our work day, that we forget about “how” to rest. Plan beforehand what you will do your rest. Here are some ideas: Nap, read, meditate, get a snack. Zero notifications: One of the best ideas I’ve ever had was to follow Joel’s advice on Zero Notifications. Having absolutely no counter on my phone or computer changing from 0 to 1 and always breaking my focus has been a huge help. If you haven’t tried this yet, try to turn off every digital element that could become an alert. The comments to his post are also very interesting. People have a lot of different perspectives on things. My guess is that a lot of us have already adapted his as well as our own ideas toward managing our work. I’ve been in my business 31+ years and guess that I keep things at least somewhat in balance. I was going to the gym 5 or 6 hours a week but that ended because I blogged about Planet Fitness and some issues of trust, respect and engagement related to their leadership that were pretty obviously poor in the impacts on their workers. Those workers have some obvious issues of being poorly managed, in my opinion. 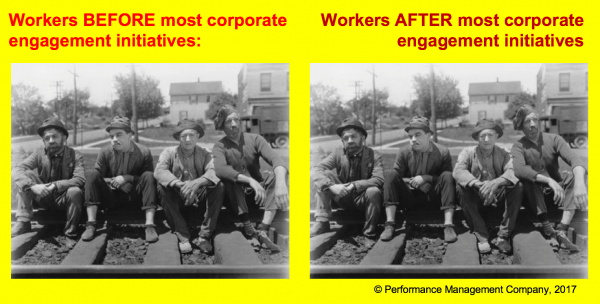 I also edited an older blog of mine to capture some ideas about how we can look toward making the workplace a more involved and engaged place and how to improve motivation. You can find “The Future of Work…” here. And, I was sent a link to a short slideshare on the work environment, focused on furniture and lighting and design. I thought it was interesting. You can find that here. and that quote has stayed with me for 20+ years. So, in my work on designing a new team building game that will anchor to trust, Frank and I reconnected and he pipped me over to Barbara Kimmel, who is the Director of Trust Across America. You can click on the link below and pop over to her website. Gallup’s research (2011) places 71% of U.S. workers as either not engaged or actively disengaged. The price tag of disengagement is $350,000,000,000 a year. That approximates the annual combined revenues of Apple, GM and GE. There are lots more statistics and I refer to bits and pieces of much of the literature and statistical proofs of impact of building trust and involving and engaging people in a wide cross-section of my blog posts about people and performance. Many of the key phrases below link to my blog articles on people and performance. For example, you can read my article on Building Trust clicking here. This trust gap negatively impacts so much of the workplace. It directly impacts morale and increases employee turnover and decreases engagement. It is an issue of management and leadership. And it is not an issue of adding more extrinsic rewards to generate desired performance or improve results — those actually just work against you and often make the workplace LESS collaborative. One of the potential tools you can use is the approach of building more collaborative teams and generating more alignment to shared goals and missions. Those kinds of initiatives tend to pull people together and generate improved morale, peer support and intrinsic motivation to improve. And if I can help you frame up or discuss different issues and opportunities around your organization’s performance improvement and trust building, please contact me directly. I actually answer my own phone! Trust is the Residue of Promises Fulfilled. My good friend Frank Navran told me that 20+ years ago and it was certainly a great way to remember a really important factor in human relations. Trust is the promises fulfilled. So hard to build, so easy to damage. Hard to repair. In the workplace, it is one of the really key factors in engagement and overall morale. If the workers do not trust their manager, and that can happen at any level, it is really hard to do those things that make an organization successful. People will avoid risk, bond together against leadership, etc. The word “sabotage” comes from the French word for wooden shoe. Those were often found in the machinery during the French industrial revolution (and elsewhere) as managements tried to implement change and process improvement. If you have a valuable employee, why simply generate distrust and antagonism when you can find some way to use the positive energies and enthusiasm for business improvement? “Please tell me how you would rate the honesty and ethical standards of people in these different fields – from very high, high, average, low, or very low? How about X, where X was randomized across different surveys. Nurses were highest, followed by pharmacists and medical doctors. Healthcare came out pretty good, and we hope that it should. Dentists did well, too. Not so good? The predictable “Car salespeople.” Okay, that was not unexpected, right? Car salespeople CAN do things to build trust over time, like fairly representing their products and prices and all that. I would go back to Wendy again and even got my daughter a used car from her. But what about “our elected representatives?” Is it too late for democracy? CAN they actually do some things to rebuild trust? One would hope. We have a great need to re-engage people. When surveys show that engagement has actually dropped from 23% to 14% recently, that is a signal that change is needed. We need to do some dis-un-engagement and engagimentation, we need to so some team building and leadership development. We need to get more people believing in more positive things about the corporations that are critical component of the success of our country (and any country). The businessinsider.com website has some shocking statistics on how bad things really are and maybe they will shock YOU out of your lethargy. As they say on the site, “If we do not educate the American people about how deathly ill the U.S. economy has become, then they will just keep falling for the same old lies that our politicians keep telling them. This is not my normal kind of post, but I saw these statistics and they speak to themes of productivity and performance, to people who should be involved and engaged in workplace improvement. But it is hard to focus on success when you are focused on survival and so many of these statistics are just depressing when it comes to improveing things in America. #1: A staggering 48 percent of all Americans are either considered to be “low income” or are living in poverty. #6: There are fewer payroll jobs in the United States today than there were back in 2000 even though we have added 30 million extra people to the population since then. #22: New home construction in the United States is on pace to set a brand new all-time record low in 2011. #32: According to a study that was just released, CEO pay at America’s biggest companies rose by 36.5% in just one recent 12 month period. Do you think that this can continue without us doing something differently? Does it really seem that cutting government benefits is a logical thing to do with so many people suffering. Doesn’t it seem like our government should be creating jobs and building infrastructure in The United States rather than fighting supposed “wars on terror” in other countries. Do you really think that our stand on social issues like abortion or on drug consumption or any of those other aspects of choices people make will solve any of these problems? Will our spending on the militarization of our police departments, with huge spending for equipment but not much for hiring, cure any of these problems listed above. This written and produced during my business trip to Mumbai and Bangalore, India, where we are focused on improving business productivity by increasing employee engagement and teamwork. We need to make some very basic readjustments to our economy and bring back higher-paid workers, improve management salaries and make this country more fair to all workers. It CAN be done. But we need more innovation, better leadership, more employee involvement and better organizational collaboration.